Brazil. North is at top. Relief map of Brazil (yellow) in South America, showing the borders (white lines) of the surrounding countries. 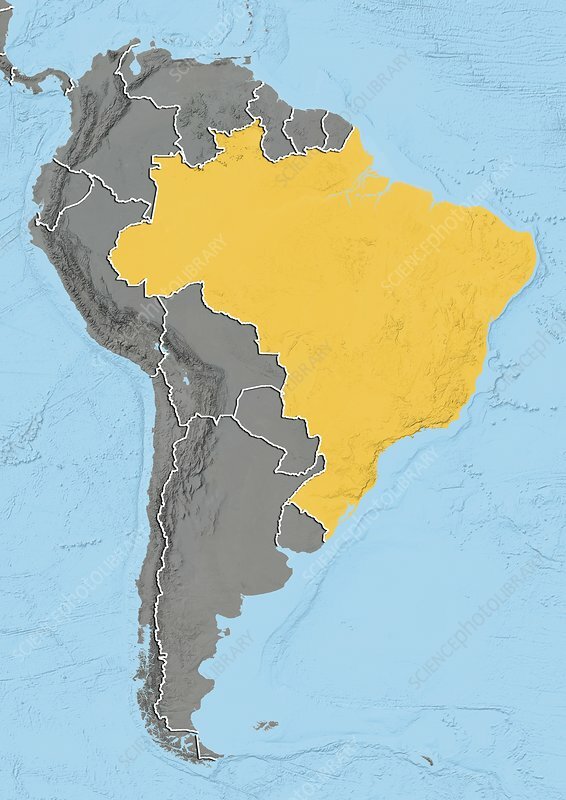 Brazil is bordered on the north by Venezuela, Guyana, Suriname and the French overseas region of French Guiana; on the northwest by Colombia; on the west by Bolivia and Peru; on the southwest by Argentina and Paraguay and on the south by Uruguay. The Atlantic Ocean (blue, right), Pacific Ocean (blue, left), and Caribbean Sea (blue, top left) can also be seen. Image compiled using elevation data, in 2012.